Home» AP LATEST UPDATES | EDUCATIONAL PORTAL » AP TET 2018 Session wise Paper 1 Paper 2 Paper 3 Add Score Details. 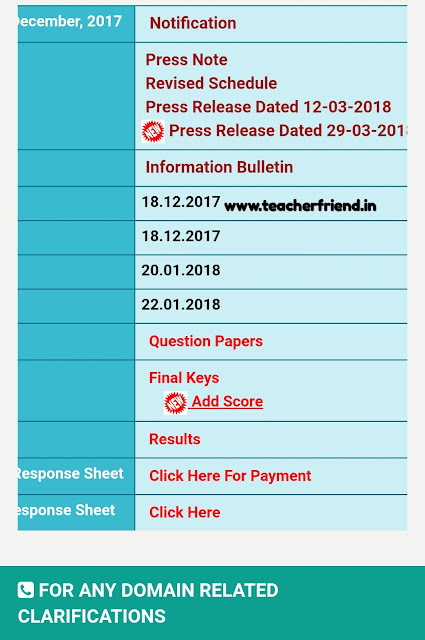 AP TET 2018 Session wise Paper 1 Paper 2 Paper 3 Add Score Details. AP TET 2018 Session wise Add score details for Paper 1 and Paper 2 Maths and Science and Paper 2 Social Studies and Paper 3 Language telugu hindi Session wise Add Score Details Download at aptet.apcfss.in/AP TET Session wise Paper 1 Paper 2 Paper 3 Add score details/AP TET 2018 Paper I/Paper II/Paper III Session wise Add Score Details Download. It is informed that there are certain general concerns/rumours raised in relation to APTET-2017. Certain specific grievances are also raised by individual candidates at web link https://cse.ap.gov.in; https://aptet.apcfss.in/ and are being addressed.Current Status of Grievances. 9,676 grievances are received seeking corrections to the demographic data – name, date of birth, caste, etc. Of these 4,870 complaints are redressed so far. Balance will be resolved soon. 1356 candidates complained that 5 Questions were not displayed on Paper-I on 24/2 morning session at certain centers. Audit Trail reports pertaining to such candidates were submitted to Evaluation Committee for verification and reply. Responses will be sent to the candidates soon. APTET 2017 Concerns and Clarifications 29.3.2018 Session wise Add score Details. Payments are received requesting for Audit Trail Reports from 30,591 candidates. All the 30,591 Audit trail reports are enabled for downloading. So far, 23,103 candidates have downloaded their Audit Trail Reports. As requested by the candidates it is informed that a letter was addressed to the Govt. for conduct of another TET before the commencement of Teacher Recruitment Test (TRT-2018) to be scheduled. Get Download Add Score Details Session wise Click Here.